Is Maldives India's Grenada, and will Narendra Modi be India's Reagan? Home Opinion Is the Maldives India’s Grenada, and will Narendra Modi be India’s Reagan? Is the Maldives India’s Grenada, and will Narendra Modi be India’s Reagan? The Maldives offers Modi one of his gravest foreign policy challenges to date. He had made a reputation as a man of iron. Let him not let that iron go to rust. Under the redoubtable Ronald Reagan in 1983, the United States sent troops into Grenada, a Caribbean speck much farther away from the American mainland than the Republic of Maldives is from mainland India. The US forces ousted a violent, communist, Cuban-backed regime that had suspended Grenada’s democracy and was hostile to the United States, and restored a democratic order that was appropriately pro-American. I’m attempting to draw a parallel here: There is today in the Maldives—which is even more intimately in India’s sphere of influence than Grenada was in Washington’s—a regime that has hijacked Maldivian democracy, is almost pathologically antagonistic to India and is backed by a China that’s muscling hard into India’s rightful precinct. So: Is the Maldives India’s Grenada, and will Narendra Modi be India’s Reagan? Will India send troops to the Maldives to oust the local dictator and bring back (a pro-Indian) democracy, in the process drawing a red line for China the way Reagan drew one for Cuba (and its Soviet patrons)? Or will India stop yet again on the cusp of action, confirming its condition as a nation that doesn’t quite have the testicular fortitude for international leadership? One hungers to ask these questions because India has sent troops to the Maldives before, in 1988, five years after that American invasion of Grenada. 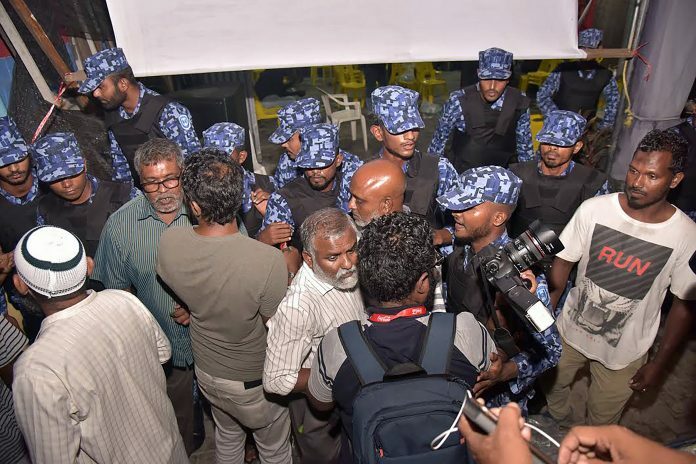 Mercenaries backed by a Sri Lankan Tamil terrorist group had taken over the capital of the Maldives and the government of India, responding to an SOS from the Maldivian president, sent troops swiftly to beat back the incursion and restore order. Thirty years later, we’re entitled to ask whether India can—and should—do the same? Let us first look at an inconvenient fact. India’s rescue of the Maldives in 1988 happened on the invitation of the country’s lawful government. As such, it wasn’t an armed trespass or a violation of Maldivian sovereignty. By contrast, any India military intervention in the Maldives today will happen in the face of shrieking resistance from President Abdulla Yameen Abdul Gayoom, who will assert that it is a violation of his country’s precious sovereignty. China, which has already warned India against interference in the ‘internal affairs’ of the Maldives, will surely concur. It’s even possible—and this is the stuff of potential nightmares—that Gayoom will appeal to Beijing to help him deal with the Indian military incursion. We could, in effect, have a much-magnified Doklam-on-sea, with China’s and India’s roles reversed and a serious danger of wider conflagration. One, an invasion was necessary to safeguard the lives of the hundreds of American medical students who were resident in Grenada, suddenly vulnerable to loss of liberty and life under a Cuban-backed, anti-American regime. Two, an invitation from Sir Paul Scoon, the (titular) governor-general of Grenada, meant that the US could claim it was entering with lawful permission. Four, to restore democracy and prevent a hostile foreign takeover of Grenada. The US invasion was greeted with enormous international criticism, with 198 votes at the U.N. General assembly in favour of a resolution condemning the invasion, nine against and 27 abstentions. Piquantly, for our present purposes, India voted to condemn the US invasion. But India’s foreign policy at the time was self-defeating and nonaligned. This was 1983, we had just won the cricket World Cup, but were dismal laggards in every other sphere. India, today, is entirely different. To what extent can this realist, modern, assertive India emulate the Grenada story? To start, there are nearly 30,000 Indian nationals living and working in the Maldives, from doctors and teachers to hotel managers and semi-skilled workers. Their security has to be of the utmost concern to the government of India. Any threat to their lives and well-being—or even a credible perception of such threat—could form a basis for Indian intervention. The other American arguments for intervention are, however, not present here. Unlike Grenada, there is no pliant governor-general to give us his imprimatur for invasion. There is also no regional fabric with which India can dress up a case for intervention: SAARC does not offer the same comfort to India, in a treaty or in spirit, as the OECS did to the U.S. There is, however, the fourth—and most controversial—of the US arguments, that of intervening to restore democracy and prevent a hostile, foreign take-over. Here, India may enjoy more political traction in 2018 than the US did in 1983 when such politically curative intervention was almost entirely novel. Democracy in the Maldives has been stamped out by President Yameen. He has defied the country’s Supreme Court, which had ordered him to free jailed leaders of the political opposition, and, in retaliation, imprisoned the chief justice and another judge of the court. Citizen protests have been suppressed by force, and the media has been squashed. The exiled former president Mohamed Nasheed and other opposition figures have called on India to impose harsh sanctions against the Yameen regime. India must do so, and also enlist the support of the US, the European Union, and Saudi Arabia. In addition to killing his country’s democracy and jailing his judges, President Yameen is also beggaring the Maldives by hurling the country headfirst into a Chinese debt-trap. Chinese infrastructure is being built with no transparent account of the magnitude of the loans involved or their terms of interest; and a Maldivian atoll has been sold to a Chinese company for a song, giving rise to fears that China will set up a naval base in the country. Does a usurious Chinese financial take-over offer a basis for an Indian military intervention? Not in conventional international relations, for sure. But India needs to make a self-protective leap of the imagination. The Chinese debt-trap is the modern-day equivalent of the Soviet infiltration of the old, Cold War days. China is looking to places—and adopting means—that exploit Indian vulnerability. These are nakedly hostile acts, and India needs to see them as such. There’s also the worrying growth of Wahabi-Islamist movements in the Maldives, which does give India genuine—and massive—cause for concern. Maldivians have gone in disconcerting numbers to fight for the Islamic State (Daesh), and Islamism has made such rapid strides within the country that ex-president Nasheed—who was toppled by an Islamist-backed coup in 2012—has warned of the strength of Muslim radicals in the police and military. The Islamists, he has said, “are using the Maldives military to train their people.” This is a direct threat to India’s security. India has, here, the basis for intervention if it can muster the political will. It has citizens who could soon be in harm’s way in a neighbouring country whose democracy has been violently terminated by a dictator who hobnobs with radical Islamists. And there are clear dangers that the Maldives could become a terrorist haven if the present threat is not arrested forthwith. No one would say that all of this gives India a cast-iron case for intervention; but no one could say, equally, that the case for invasion is trivial. It is there, for those who want to see it with open and unfussy eyes. The Maldives offers Modi one of his gravest foreign policy challenges to date. He had made a reputation, in these matters, as a man of iron. Let him not let that iron go to rust. Tunku Varadarajan is the Virginia Hobbs Carpenter Fellow at Stanford University’s Hoover Institution. Here is a call to create another Syria, and the American way. Iron man is not the Superhero in Indian mythology. There are several others including a shrewd avatar of Vishnu that advised on winning in states craft. Maybe that is an option this writer did not reckon with! What can you expect from ‘As Intelligent as an Amoeba Pseudo Intellectual’ from the Donald Trump country. Maldives ” warns ” India. Those words suggest India’s neighbourhood policy needs to go back to the drawing board. Difficult to identify a single recent success, not Nepal and Sri Lanka, surely. The fact of the matter is that China no longer accepts South Asia – barring Pakistan – as our natural area of influence. It is forging strong economic bonds with each one of them. Bangladesh is unlikely to rebuff its offered line of credit of $ 25 billion. China itself posses our greatest challenge. Dokalam was a reminder that we need to think through consequences much more deeply. Maldives issued no “warning”. That was a construction of the media. Second, India’s neighborhood policy is extremely rational in pursuing India’s interests. Nepal nor Sri Lanka have been able to replace Indian influence with Chinese. And Dhoklam proved India’s policy with China is one based on both strength and wisdom. The fact that Maldives Yameen is misbehaving is his nature, not India’s diplomacy. And the fact that we haven’t rushed in guns blazing or gone overboard is a sign of India’s wisdom. Simple facts are: all these nations – Maldives, Nepal or Sri Lanka choosing to develop themselves is good for India. Who and how they develop is their business and does not impact India economically. Only when strategically or militarily Chinese involvement threatens India should India act and it has always acted. India must not bother about the internal politics of these states and democracy or tyranny , India gains nothing by making the lives of our neighbors better, as 60 years of diplomacy attest.